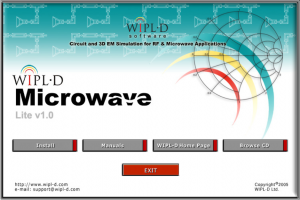 WIPL-D Microwave Lite DEMO – permanent FREE demo of 2005 release (mostly targeting the students). Please note that any FREE DEMO version has to be installed on a physical (non-virtual) machine. There are two ways to test if WIPL-D 3D EM simulation software is adequate for you. The first one is to download our FREE demo, install the software and give it a try, while the second one is to specify a relevant benchmark example and submit it to our technical support team. After you download and install the Demo, we offer a free e-mail-based training called Intro Course, comprising 3 simple tasks. This online training course is described in the Online Training section. A second course, called Evaluation Short Course comprising 6 additional tasks, follows after the Intro course. Existing and prospective users are strongly encouraged to watch Video Training Lessons with illustrative step-by-step instructions how to build a model and proceed to the analysis for a number of practical antenna structures such as dipole, monopole, horn, microstrip patch etc. 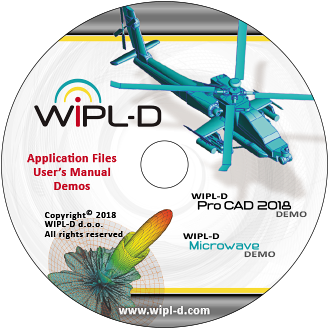 WIPL-D Pro CAD 2018 FREE DEMO! This 3D Electromagnetic simulation software FREE Demo contains our two main products: WIPL-D Pro CAD 2018 and WIPL-D Pro v15. It is time-limited and can be used for 30-days only. The installation includes WIPL-D’s newest software demonstration, with full functionality in terms of interface and simulation settings, but with limitations in number of unknowns (333). This basically means that any project can be created, but it can be simulated only if it fits in the limited number of unknowns. In case that the number of unknowns exceeds the limitations of this FREE Demo version, a request can be sent to our technical support team to execute the simulation and present the results. To get more information on the unlimited product versions, see more on the Product pages WIPL-D Pro and WIPL-D Pro CAD. The main purpose of this FREE Demo is just to illustrate the functionality of WIPL-D Microwave, the circuit solver, and the 3D Electromagnetic (EM) solver. This demo comprises a full set of example projects from WIPL-D Microwave Lite. Some of these projects can be simulated, others have pre-calculated results but cannot be re-run, because of the limitations of the demo. The microwave circuit solver in this demo is limited in terms of number of components that can be included into the circuit and the number of nodes in the circuit. This demo is not time-limited, so after download and installation it can be used for free, permanently. You need to register and log in first to download the demo version.